Machine Learning is at the forefront of advancements in Artificial Intelligence. It’s moving fast with new research coming out each and every day. This Series, along with the other posts includes some of the important concepts and notes right from the basics to advance, from the book Machine Learning, by Tom M. Mitchell. And will be updated for each chapter of the book. Performance P : percent of game won against the opponent. Training Experience E : playing practice game against himself. Task T: recognising and classifying handwritten words within images. Performance P: percent of words correctly classified. Training Experience E : database of handwritten words with classification. Type of training experience from which our system will learn. The type of training experience plays an important role in the success or failure of the learner. One key attribute is whether the training experience provides direct or indirect feedback regarding the choice made by the performance system. 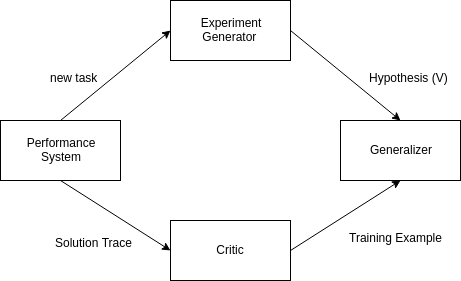 The second key attribute of the training experience is the degree to which the learner controls the sequence of training example. The third key attribute of the training experience is how well it represents the distribution of examples over which the final system performance P must be measured. The exact type of knowledge to be learned. Representation of this target knowledge. We can represent V using a collection of rules that match against features of legal moves or a quadratic polynomial function of predefined moves or an artificial neural network. Assign the training values of for any intermediate board state b to be , where V^ is bot’s correct approximation to V.
successor(b), next move following b. To define the best hypothesis, or set of weights, or approach, is to adjust the weights to minimise the squared error E between the training value and the values predicted by the hypothesis V^. It involves searching a very large space of possible hypothesis to determine the one that best fits the observed data. Which algorithm performs best for which types of problems & representation? How much training data is sufficient? Can prior knowledge be helpful even when it is only approximately correct? The best strategy for choosing a useful next training experience. What specific function should the system attempt to learn? How can learner automatically alter it’s representation to improve it’s ability to represent and learn the target function? Remember to give this post some 👏 if you liked it. Follow me for more content. Machine Learning Notes 1 was originally published in Hacker Noon on Medium, where people are continuing the conversation by highlighting and responding to this story.